If you’ve been following how the Fascist Left works for any length of time, you know that much of what they do is designed to 1) overwhelm the average person with a constant barrage of misinformation and, 2) change meanings of normally accepted words to mean something else. This has been what they’ve been doing for decades and it is what we’re seeing at the fore of any “dialogue” or “conversation” that occurs between people on the left versus those on the right. We’re all familiar with how the left (largely with the cooperation of the biased media), began using the word “assault” in front of the word “rifle” to make it appear as though one particular style of weapon was clearly designed to “assault” people, as opposed to other forms of guns. In reality, there is no such thing as an “assault” weapon or rifle. All such rifles – whether AR-15s, .270, 30/30, or even the tried and true .22 caliber rifle all do the same thing. As semi-automatic weapons, they will shoot bullets only as quickly as the shooter pulls the trigger. In fact, while the military-looking AR (“AR” stands for Armalite, the manufacturer, though any rifle that looks similar is often called an “AR”), is often associated with the world “assault,” it is by no means the most powerful rifle in the world. It’s one of Alinsky’s rules whereby “truth” is created through a presented narrative even though untrue. Not an “assault” rifle since this label is a complete misnomer. So even though the actual truth is that there is no such thing as an “assault” weapon, the label has picked up steam and been accepted as part of the vernacular within the mainstream. Now, when someone mentions an “assault weapon,” people immediately think of the type of weapon shown in the image as if it is actually a military weapon. Soldiers don’t use that weapon though. For an explanation of the type of weapons used in war, follow this link. None of the weapons listed there are called “assault” rifles. While some may look similar to the AR-15, that huge difference is in the ammo, capacity, and whether or not the weapon is semi or full auto. Google has specifically associated fascism with the right (conservative). …a political philosophy, movement, or regime (as that of the Fascisti) that exalts nation and often race above the individual and that stands for a centralized autocratic government headed by a dictatorial leader, severe economic and social regimentation, and forcible suppression of opposition. One page on the ‘Net states that the definition of fascism is rather complex, but came to the fore through dictatorships headed by Hitler and Mussolini during WWII. Of course, what is also fascinating is that the left, not only wanting to pin the label solely on those on the right, has deigned to define the word as applying only to those on the right. 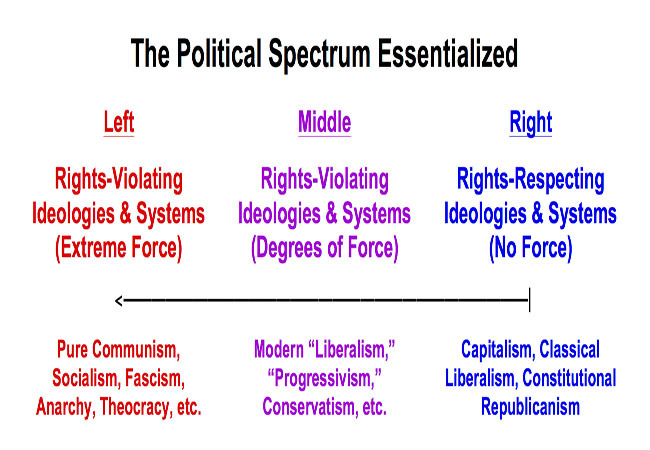 Of course, this is disingenuous because any political party or movement can be fascist in its ideals and ideology. Political conservatives advocate for small, less intrusive government where power rests with the states and individuals, and the federal government lives within its Constitutional restraints. *Progressive liberals advocate for just the opposite: a powerful central government with authority vested in a strong leader who has the ability to impose decrees from Washington on everything from health care to education. It can be intelligently argued that Hitler was a fascist though he was on the left politically. It is very clear that the movement he began (the Third Reich) was extremely fascist within German society and his attempts to create a Germanic Utopia for German people specifically. So when the left tries to create the narrative that Trump or those who support him are fascists, the truth is that the Left are involved in another of their games to redefine established meaning as something else. This is how they work and they’re also attempting this with transgenderism. They are trying to make people believe that in spite of laws of nature, biology, or chromosomes that actually define people as male or female, the Left wants us to ignore millennia of accepted fact in favor of how people simply view themselves (how they “identify”). This is absurd. If I identify as a dog or cat, does that mean I am one? Tucker Carlson recently posed a question to one of his guests regarding the ramifications of this type of self-identification. He asked what would stop and individual who is biologically male, but identifies as female, from joining a female sports team? The individual he debated – Zac Petkanas – didn’t really answer the question. He tried to state that there was plenty of “science” behind transgenderism (there isn’t), and the idea of a man joining a woman’s sports team was a right-wing fantasy. Carlson responded with an offer of $1,000 to any actual scientist who could show proof that there is actual physical science behind transgenderism. You can watch the interaction below and you will probably not fail to notice how many times Petkanas attempts to redirect and accuse instead of answering questions directly. Interestingly enough, there have already been several examples of men who allegedly identify as women taking on other women and winning. Transgender MMA fighter Fallon Fox literally beat “her” opponent, giving her a concussion and breaking her eye socket. In a more recent example, stated transgender Mack Beggs wrestled girls to take the championship in Texas. In Mack’s case, he doesn’t even remotely resemble a woman. His chromosomes and other biological factors prove he’s a male, yet because he says he’s really a female, he was allowed to enter into the wrestling competition against females and won. These two examples alone prove that Zac Petkanas has no clue about truth or facts. It doesn’t mater though because it also proves to us exactly what depths the Left will stoop to change truth and create a new narrative. In truth, the further left we move politically, the more intolerant and fascist things become. The image presents the picture accurately. Conservatives essentially love freedom and smaller government interference or less government oversight. We support the rule of law under the US Constitution. We believe there should be less government oversight and intervention because less government means more freedom. It is the left that prefers and pushes society toward greater government oversight and intervention, which ultimately results in less freedom for citizens. Of course, the Left cannot allow (tolerate) this idea that they are actually the ones who are intolerant, racist, bigoted, and ultimately even fascist, so they must do whatever it takes to redefine terms for their benefit. Google has helped by changing the meaning of the word “fascist” so that it applies only to the right. In reality, any group can ultimately be fascist if their goal is to have only their political opinions allowed and everyone else must be silenced. The only group that is doing that today is the Left itself and they are doing it because they need to silence any and all opposition. That is the only way they can gain anything in society, but shutting down opposing beliefs/opinions. This is, of course, also why true liberals are not necessarily Leftists because a liberal, in the true sense of the word allows for dissent and opposing opinions. Conservatives, while we may disagree with others, also certainly agree that they have the right to their opinion under the Bill of Rights. Those on the left understand that they must silence all opposition so that an air of agreement is seen. This is what occurred under both Hitler and Mussolini where people became too afraid to state any opposition against those dictators or the party line because it ultimately could mean the loss of one’s life. 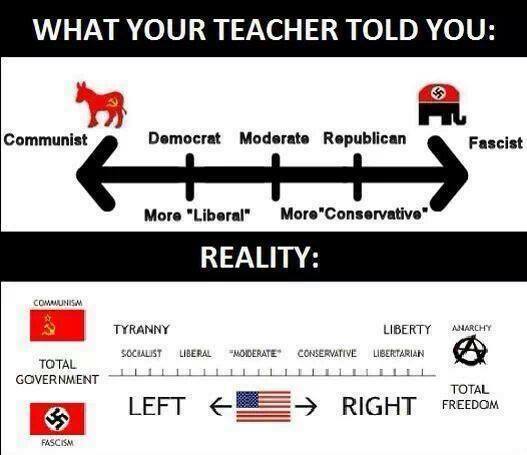 Today, the Left is acting just as Hitler, Mussolini, and many other historical dictators acted, though this is what the Left accuses conservatives of being. To create a sense of unanimity, all opposition must be silenced. Once this is accomplished, then the outward expression is in full agreement with the Left, through fascism, which is the means of ensuring what people believe (through force if necessary). I believe had Hillary Clinton been elected, we would have seen much more of this come to the fore with conservative thought being actively rejected and suppressed. Because Donald Trump was elected, we have started to see the push back against Leftist ideology that came to the fore during the Obama Administration. The problem though is that the Left is now working overtime to destroy the Trump Administration and those who support it. The media are being shown for what they are – propping up the lies of the Left – and people are starting to see it very clearly. Because of President Trump, conservatives once again have permission to speak freely, though the left certainly wants to continue to try to shut us down. The big difference now though is that President Trump supports the rule of law as expressed and guaranteed under the US Constitution. Because of that, we are seeing the left scrambling to block everything he does. Of course, these leftists do not have the broad support of the presidency as they did under Obama and this means a great deal to conservatives. Conservatives and especially conservative Christians can now speak freely and boldly. We must realize the true nature of this privilege (right) and use it for the cause of Christ. Understand your rights as an American citizen and understand that because of Trump’s support for Israel, there is a great chance God will once again smile on the United States. This can create a false sense of security within us. We cannot take anything for granted. Understand what “time” it is and be mindful of the fact that God is pushing back the darkness for now. Instead of getting lazy about that, we need to continue pushing and taking opportunities to spread His gospel wherever we find them. We cannot fear the Left just as we cannot fear Satan. Ultimately, things will darken up again eventually, but it may not occur in earnest until after the Rapture of the Church when the channel through which the Holy Spirit has been working will be taken out of this world. Imagine that point when it will appear as though society has collapsed. Once the Church is gone, there will be nothing standing in the way of Satan and his minions. Darkness will cover the earth and that, coupled with God’s wrath that He pours out onto the remaining people on this earth, will create a totalitarianism and fascism that will make Hitler’s fascism look like a picnic. The world continues to move toward its date with God’s judgment but it seems for the time being, light is shining in through at least some of the darkness. That is remarkable in itself, but does not mean that darkness will never envelop society again. It is coming. It is written in His Word. Be wise as serpents and gentle as doves as you take every opportunity to spread His gospel. Entry filed under: Agenda 21, Atheism and religion, christianity, Communism, Cultural Marxism, Demonic, devil worship, Emotional virtue, eternity, Global Elite, Gun Control, Life in America, new age movement, Political Correctness, Politically Correct, Politics, Pretribulational Rapture, rapture, Religious - Christian - End Times, Religious - Christian - Prophecy, Religious - Christian - Theology, Romney, salvation, second coming, Socialism. Tags: ar-15, assault rifle, assault weapon, conservatives, dictatorship, fascism, leftism, libertarian, marxism, political ideologies, political movements, totalitarianism, transgender, transgenderism.